The Catalan public media has sent a message of unity this Wednesday in the face of the Spanish government’s intended intervention via the application of article 155 of the Constitution. TV3, Catalunya Ràdio and ACN (Catalan News Agency) held a joint press conference to express their rejection of any intervention and to denounce what they consider to be “[unacceptable] interference (…) in a democratic Europe”. A number of journalists read a manifesto which describes the intervention in the public media as a “direct attack on the citizens of Catalonia” and a violation of their right “to true, objective, pluralistic, balanced information”. Read first in Catalan and then, with minor changes, in Occitan, Basque, Galician, Spanish, English, French and German, they defended the work Catalan public television and radio has carried out since 1983 and argued that their “maximum plurality and veracity” has made them “the most trusted and highest-rated source of news in Catalonia”. Among those to read the manifesto were notable figures like the journalist and professor Mònica Terribas, the journalist Ramón Pellicer and TV3’s Washington correspondent Raquel Sans. 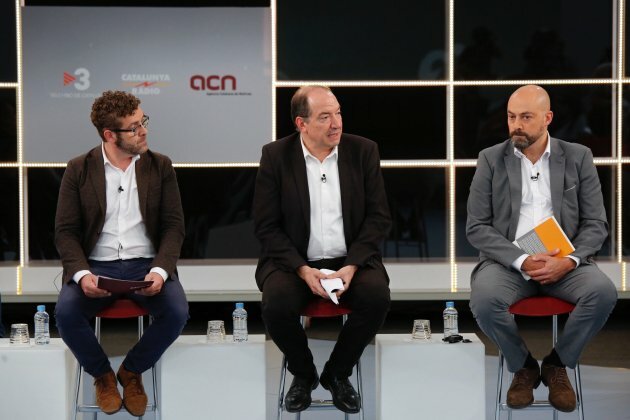 After the manifesto was read, the directors of TV3, Vicent Sanchis, Catalunya Ràdio, Saül Gordillo, and ACN, Marc Colomer, took questions from the some sixty journalists in attendance. Before this audience, which included a strong presence by international correspondents, the directors wanted to give a message of unity and defended their opposition to the intervention. Sanchis said that the staff of TV3 “will continue working as [we have done] until now”, giving a message of calm while waiting to know the full extent of the effects of the imposition of article 155. Asked which programmes might be affected, Sanchis asked them to avoid “apocalyptic scenarios”, saying they would wait to see how events develop, both from the Catalan government as from the Spanish. “If they want truth they will have to continue working as so far”, he said, adding that this was “indisputable”. Sanchis also said that they would study all “legal weapons” to avoid intervention. He said that it’s “incredible” that “an article of the Constitution should attack the Constitution”. In the face of this “full-scale attack” he called for waiting to see what the next actions by the Catalan government would be, what actions they might undertake. Gordillo, for his part, expressed his “concern” over the intervention, but also his “hope” thanks to all the shows of support they had received: “It encourages us that, not only will we not give up, but we will try to remain upright”. He also noted that work has been carried out over some time so that the public media doesn’t depend on the Catalan government, but on the Parliament. As such, he said he has a “double worry”, one from depending on a government and one that this government might not be the Catalan one, but the Spanish one. For ACN, Colomer described the intervention as an “offence towards the professionalism and dedication of our journalists” and said that they will continue carrying out their jobs “with the maximum professionalism, pluralism, rigour and veracity”. The director said that “any attempt at control or oversight which doesn’t come from the institutions of the Catalan Parliament, would stop being democratic control”, rather that it would have objectives far from those of achieving “truthful information”. During the questions session, the president of the staff committee, Roser Mercader, also spoke, saying that “the staff’s objective is to continue working as until now”. Mercader expressed the “worry” of the workers over the application of article 155, emphasised the importance of TV3 in terms of news and as an engine for the audiovisual industry and said that they will continue working to remove government control of the public media. Also to take part in the press conference were the governing council of the CCMA (Catalan Audiovisual Media Corporation), the professional boards of TV3 and Catalunya Ràdio and the staff committees of TV3, Catalunya Ràdio and ACN, a clear message of unity from all the professionals involved in the public media. In terms of covering media, some sixty journalists from around Spain and the world also attended. Among them were CBS, the BBC, France Info, RAI and the news agency AFP and Reuters.